We need your help with new research on preventing falls. Did you know that falls accident is a major health problem increasing its rate worldwide? Falls accidents among older adults are known to be the third leading cause of chronic disability with an immense impact on the National Health Service causing a cost of more than £2.3 billion per annum. Indeed only in the UK 30% of people over 65, and 50% of individuals over 80 falls at least once per year. According to previous findings, the actions that maintain balance in response to destabilising forces acting upon the body can be helped by respiratory muscles. 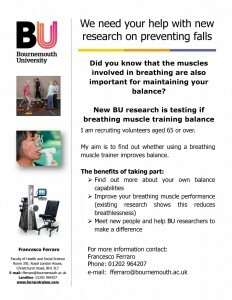 But we need to understand more about how these muscles can contribute to enhancing human balance, and for this reason, I am now recruiting participant aged 65 or over to take part in a new study that will deepen the role of inspiratory muscle in postural stability. Do you wish to take part? I will be happy to give you more information and meet you. I am really sorry for delay in reply, but I didn’t receive any notification.